Xbox 360 videogame pirates that recently updated the dashboard will find their illegal abilities sorely reduced. A major dashboard update hit Xbox 360 consoles on November 1, adding Kinect compatibility, features such as a Netflix search and ESPN streaming content, and it moved things around enough to anger independent developers. According to new information, Microsoft evidently also included a stealth update that protects the Xbox 360 from piracy. The update, being referred to as "AP 2.5," apparently locks out copied games from Xbox Live and will stop them from booting up at all. The method of its operation is not yet clear, but AP 2.5 basically involves a new disc check. If that disc check isn't passed, the console running a pirated disc will be flagged for a ban from Xbox Live. The game itself won't load, and will give the player an "unrecognizable disc" error. 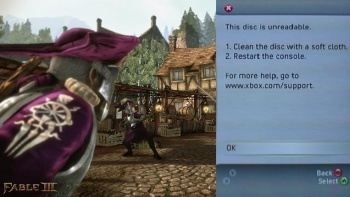 Hackers have already determined that Fable III has this AP 2.5 protection, and it'll likely be in all future discs as well. This is said to be the first time that "backup" games have been negated in such a way. The battle against videogame piracy will never end, but Sony got off a good salvo earlier this year and now Microsoft is doing some damage of its own. If we hear about a large number of Xbox Live bans in the near future, they'll probably be the result of this new piracy defense method.